If it’s June, Cloudinary must be in the throes of conference season. In a recent blog post, we discussed how we WOW’d the crowd with our fully automated image management tools, exhibiting at Velocity Santa Clara. But that wasn’t the only place we have been wowing developers and the cloud community; we also attended two events in Israel last month. The first was June 16th at the AWS Summit Tel Aviv 2016. With a focus on the cloud, and attracting some of the biggest brand names in Israel and around the globe, AWS was a great event for us to showcase our company and demonstrate our technology. We’ve been attending this event for the past three years. This year a majority of attendees were especially interested in our video solution. They’ve already been working with images for a long time and they understand how to optimize them. But the addition of more video content in websites and applications is posing serious challenges – the files are larger and are slowing down their website performance, making the choice of the correct format more relevant and pressing than ever. Our demos showed them how Cloudinary makes managing videos just as easy as images. The second event, You Gotta Love Frontend (YGLF) Conference, in its second year, brings together a highly focused group of 800 or so developers. We were excited to meet such a relevant audience, several of whom are existing Cloudinary users. Being mainly front-end developers, they encounter the issues we address on a daily basis, and Cloudinary’s solution and benefits were immediately clear. A few seconds into the demo, already impressed by Cloudinary, the attendees started asking lots of interesting and relevant questions, engaging in framework specific discussions and feature requests. Christian Heilmann (Developer Evangelist, Edge browser team at Microsoft) gave an inspiring opening keynote about "Automating the wrong things". At Cloudinary, we were flattered that Christian recommended Cloudinary's image management solution as an example of a solution that is definitely automating the RIGHT things. Vitaly Friedman (Editor in Chief, Smashing Magazine) gave a great talk about cutting-edge responsive web design. For example, exposing powerful CSS techniques for creating responsive emails, although Vitaly himself said "don't try this at home". Vitaly discussed responsive image challenges and specifically showed Cloudinary's Responsive Image Breakpoints Generator solution. Bruce Lawson (deputy CTO at Opera) is the man behind the exciting <picture> html tag concept that enables art-direction-based responsive images in websites. Bruce reminded us how much of the world population still does not have access to the web in ways that people of western countries take for granted. He emphasized the importance of optimizing images and using more aggressive compression to allow people with slow/poor Internet connectivity to still enjoy the very media-rich web. In addition, many visitors to our booth mentioned hearing a recent podcast (in Hebrew) by our CPO and co-founder Nadav Soferman, during which he talked about Cloudinary’s bootstrap beginnings. As start-up founders themselves, these visitors wanted to learn more about our history and strategies for success in bootstrapping. And if you thought we only focused on serious business at YGLF, you’d be mistaken. 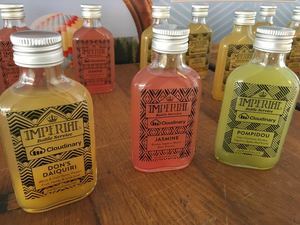 We also treated attendees to their own custom cocktails from the Imperial Bar. Now that it’s July, our schedule isn’t slowing down. Just last week we were at AWS London, and you can catch us this week at AWS Santa Clara. We hope to see you!